On Day 2 we set off together from Ruthernbridge and cycled to Grogley Halt on the Camel Trail. There we split with James and Ian heading north west towards Padstow picking up the A39 at Wadebridge up to Bude. Luke and I stuck to the National Cycle Network, heading south east initially and then up onto Bodmin Moor. We’d cycled together over this moor before a few years back and it howled a gale. Today wasn’t so bad but still very windy considering there was virtually no wind anywhere else. The signage up onto the moor and across it was brilliant. Bodmin is a struggle to climb onto and hilly once you are up there too. As we came off the moor we bumped into the Wisely Down pub and rewarded ourselves with an early backed potato. We then pressed on to Bude. The narrow roads which the NCN uses into Bude are extremely steep. 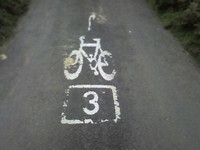 The rule was if you’re cycling less that three miles an hour, get off and walk. You go faster and exercise a different set of muscles! During one of rest between climbs we met up with a very friendly local farmer. It was a great conversation which I wished I’d been able to capture on camera: the problems with this governemnt; the right to roam; the death of farming; the Word War 2 operations of the coast here including sinking of a hospital ship (carrying arms!) etc etc. All in the space of about 10 minutes. This is where the conversation took place. We met up with James and Ian in Bude and had another lunch! After lunch we split again with James and Ian sticking to the main roads to Barnstaple while Luke and I stuck to the National Cycle Network through Holsworthy and Sheepwash. Just beyond Sheepwash we got stuck in a sort of traffic jam of Combine Harvesters and Land Rovers. We both got off our bikes and out of the way in different passing points along the road. When we set off again I thought Luke was in front of me and he thought I was in front of him. So he pedalled like mad to catch me up and I did the same to catch him up. When I got to the start of the Tarka Trail I thought I’d better phone to find out where Luke was – no signal! So I started down the Tarka trail until I go a signal (quite a long way) and then I called. Luke had picked up the other part of the figure of 8 that the Tarka trail does and was going in the wrong direction. Anyway I waited and we were off together again towards Barnstaple and the really flat old railway. We’d done 65 miles and only had 20 to go and it wasn’t dark yet! We were looking forward meeting up with James and Ian and Ian’s wife Emma and son William for an evening meal and then disaster struck! My seat post bolt broke with 12 miles to go. It was now getting dark and there was only one option. The saddle came off, Luke took most of my luggage and I pedalled the next 8 miles standing up. This was really hard especially on a small-wheeled bike and I was really worried about the balls of my feet. I thought I was going to get really deep blisters – they were red hot! After 8 miles Luke let me have his saddle – what a star and what a relief – Luke did the last 4 miles standing up. We missed Ian, James, Emma and William but had a nice late Italian meal in the only restaurant still open! I was going to need to visti a bicycle shop in the morning. This entry was posted on September 24, 2007 at 9:21 pm and is filed under 06: Days 1-3, Video clips. You can follow any responses to this entry through the RSS 2.0 feed. You can skip to the end and leave a response. Pinging is currently not allowed.